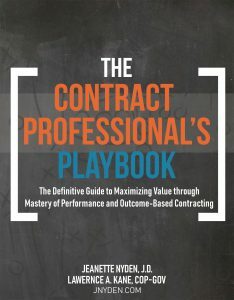 Free Sample of the Contract Professional’s Playbook! hanks for visiting. I suspect you learned about The Contract Professional’s Playbook, a web-based, self-paced program answering 12 “How do I” questions to enhance commercial contracting competencies for performance and outcome-based contracts. And, now you would like the free sample. Chapter 4 of The Contract Professional’s Playbook answering the question discussed in the video, How Do I Write/Revise/Respond To Requirements (SOW and Performance Metrics)? Full List of the Table of Tools. To Get Your FREE Downloads! You will then get an email to the download page. From there, please download the items. Link to download corresponding chapter(s) of The Contract Professional’s Playbook (sent one week at a time). Team of 10 or more: Call for pricing options including customized tools and coaching sessions. Chapter 1—How do I maximize my value in my customer/supplier relationships? Social norms to do business by.